Anytime you hire a service professional to come into your house, you should do a little homework. A few minutes online research will have you uncovering all you need to know about any company. Even if the job is something uncomplicated like junk removal you should still do your research. Here in Jacksonville you’ll find that the best company for this type of work is Junk King Jacksonville. What makes a good junk removal company? It starts with easy scheduling. Junk King that you book your appointment online or over the phone. If you book online, then you can also benefit from a discount. Either way you book you’ll be asked to pick the day and time that works best for your session. Junk King only needs you to set aside a two-hour window for your appointment. That doesn’t mean it’s going to take two hours to clear out all the stuff you want to get rid of. That just gives the crews plenty of time to get from one appointment to the next. If you have your stuff ready to go, then you might be able to request a same day pickup. Keep in mind that having your stuff ready to go doesn’t mean piling up in the driveway. 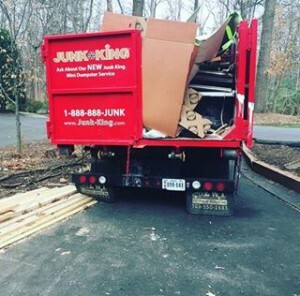 A good junk removal company does all the work for you. Junk King Jacksonville will send over two movers who will handle all the lifting and loading. They’ll also climb as many stairs as it takes to get all of your stuff cleared out. A good junk removal company also has a responsible approach for disposal. Junk King Jacksonville strives to recycle or donate the bulk of what they collect every single day. They would much rather avoid going to a landfill even if it means an extra trip to a charity or recycling center. Finally, a good junk removal company needs to have a fair pricing policy. Junk King Jacksonville’s policy is based on volume and not weight. That means you won’t be charge by the pound. Instead, you’ll be charge by how much space your stuff fills on the back of the truck. Add it all up and it’s clear that for quality junk removal, Junk King Jacksonville is the best deal in town. This entry was posted in Jacksonville junk removal and tagged Junk King, junk removal on November 30, 2017 by Junk King. Last updated December 3, 2017 .